Description: Many Pacific Northwest cities and towns bear names linked to the American Indians who inhabited the region thousands of years before the arrival of European explorers and settlers. 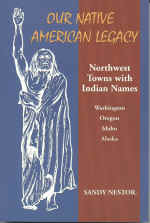 Sandy Nestor spent years gathering information about towns in Oregon, Washington, Idaho and Alaska with Indian names. She offers a brief history of each community, profiles of the founders and an explanation of the origins of the town name. 9x6, paperback, 312 pages, maps, 50 photographs.